PCJCCI is pleased to announce a thought-provoking session on “Digital Financial Services” cater for the needs of our members.Mr. TughralTurab Ali will deliver speech on the importance of Digital Financial Services in this era of Globalization and connectivity.Mr. 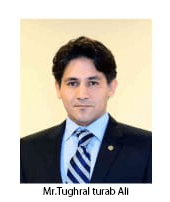 TughralTurab Ali has been considered a leader of Digital Financial Services have more than two decades experience of the field in Pakistan and abroad. He was part of the team that launched mobile money ‘’Easy Paisa ‘’ in Pakistan, led Micro Insurance in Africa and recently led Digital Banking for a microfinance bank in Pakistan. He graduated from G.I.K Institute, in Computer Systems Engineering and MBA degree from Warwick University. As a prestigious Solan fellow, he got another Master Degree in Management Studies from internationally acknowledged MIT (USA). On behalf of PCJCCI, the Chairman and members of Standing Committee on Capacity Building & Education cordially invite you to attend this session ‘’Digital Financial Services’’ on 30th January 2019 at 3:30 p.m. The venue for the lecture is Pakistan China Joint Chamber of Commerce & Industry Secretariat,2nd Floor, Mega Tower, Main Boulevard Gulberg II, Lahore. The program will end with an informative Questions Answers session. A ten members high profiled delegation headed by Mr. Zhang Zhongjun, Second Counsel, Department of Industry & Information of Shangdong Province is visiting Pakistan (profile attached). 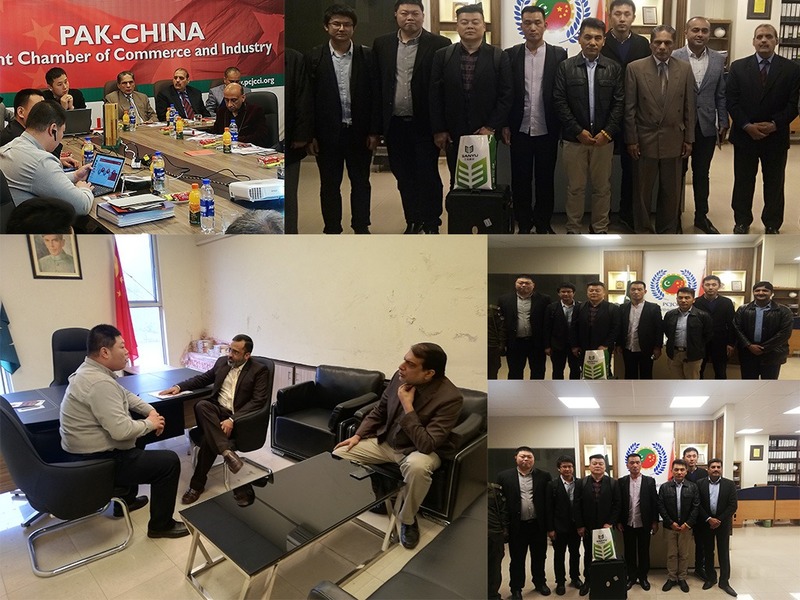 They are visiting Pakistan China Joint Chamber of Commerce and Industry on Wednesday 23rd January, 2019 at 2:30 pm and their areas of interests are Auto parts (especial for break pad and break materials), Electronical Refrigeration, Optoelectronic Communication Cable Industry, Organic pigments, Hardware and Weighting Instruments etc. You are requested to please intimate your intention to see this delegation at your earliest convenience enabling us to arrange accordingly. They want to introduce contemporary techniques in Greenhouse, seed and other area under agri sector. They want to introduce the agri cooperation area with China side in Agri sector regard as seed, equipments agriculture, training etc. The meeting was a huge success for the development of agri sector of Punjab. 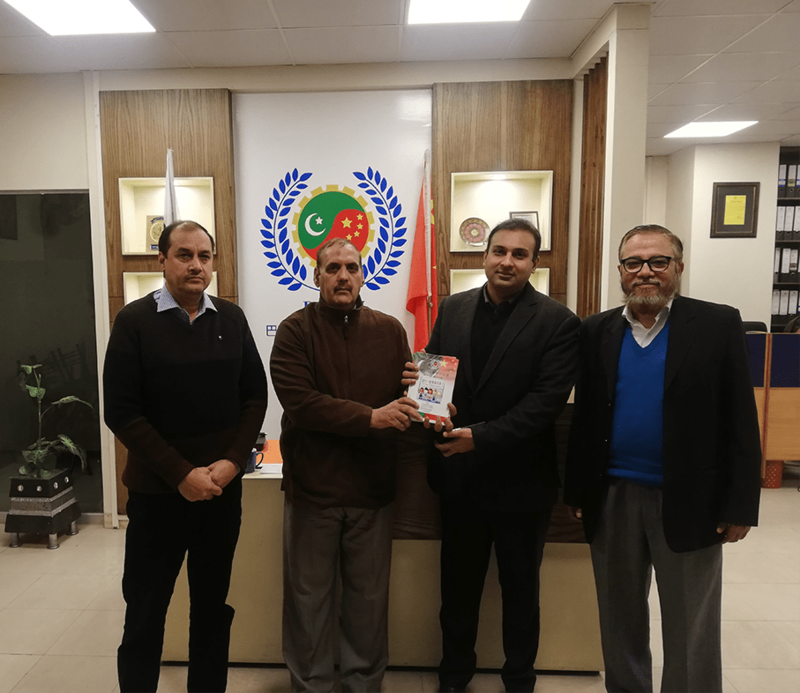 On 20th December 2018, Mr.Safdar Javaid CEO of TRUST Engineering Works visited PCJCCI and had a very detailed meeting with Mr. Salahuddin Hanif Secretary General of PCJCCI. He was so overwhelmed by the activities of PCJCCI and got inspired by the consistent hard work of PCJCCI. As a result he became our member and we honored them by gifting Chinese books. Mr. Chen Jian Cai, Mr. Chen Changwei visited PCJCCI to seek information regarding business opportunities related to Porcelain industry, they showed great interest in introducing innovative technology in this industry.PCJCCI organized B2B meeting of Mr. Chen Jian Cai, Mr. Chen Changwei with manufacturers of porcelain in Gujrat. It was followed by a site visit and detailed discussion regarding the scope of porcelain industry in Pakistan. The executives of the factory presented beautiful artistic piece of porcelain as a token of kindness. Their area of interest are floor & wall titles, Aluminum window and door, nursing communication information management system, electric meter, gas meter, water meter, Galvanized steel, and color steel titles. B2B Meeting with“International Engineering and Machinery Expo Exhibition and Agri Tech Asia" delegation held at PCJCCI Secretariat. Mian Muhammad Aslam Iqbal, Punjab Minister for Industries & Commerce and Mr. Murad Raas, Provincial Minister for Schools Education inaugurated the 16th Int’l Engineering & Machinery, Food & Rice Technology and Halal Food Asia International Exhibitions respectively under aegis of the E-Commerce Gateway and Pakistan China Joint Chamber of Commerce and Industry at Lahore Expo Center. It is notable that over 150 delegates from 11 countries including China, UK USA Germany, Italy, Switzerland, Iran and Singapore were participating in the three-day exhibitions. The exhibitions have showcased over 150 products at 350 stalls. Mr. S.M. Naveed, President PCJCCI, Dr. Muhammad Iqbal Qureshi, Senior Vice President PCJCCI, Dr. Khursheed Nizam, President E-Commerce Gateway and Mr. Ma Zhijun, President, Halal Food Association China, while addressing a press conference today at PCJCCI premises, said that this exhibition would lead the way in delivering the most outstanding opportunities for all participants in different sectors like; Automotive Industry, Engineering, Transport, Construction, Block making, Rice Technology, Food Technology, Halal Food Industry etc. more than 200 Chinese are participating in this trade fair. The companies belonging to these sectors will showcase their latest technology, equipment and innovative ideas of new products from all over the world, he added. Mr.Ma Zhijun, President of the International Chamber of Commerce of the Halal Food Committee of Sichuan International Chamber of Commerce, and S. M. Naveed, President of the Pakistan-China Joint Chamber of Commerce and Industry, met at the Consulate General of Pakistan in Chengdu, and Mr. Mudassar Tipu, the Consul General of Pakistan in Chengdu, and many Chinese and Pakistani entrepreneurs. Under the witness, the two sides signed a memorandum of cooperation on the establishment of the Pakistan-Chengdu Economic and Trade Promotion Center. On May 28th, 2018 PCJCCI President S.M. Naveed and Secretary General, Salahuddin Hanif held a meeting with Ambassador Yao Jing in the Embassy of People’s Republic of China, Islamabad to exchange views on the propositions extended by S.M. 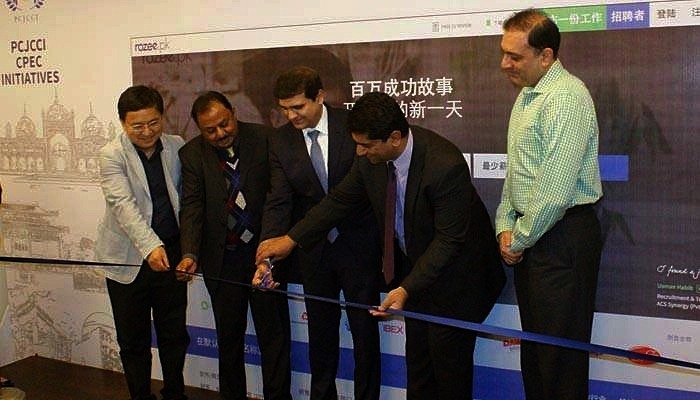 Naveed for the productive growth of Pakistan – China Joint Chamber of Commerce and Industry. S.M. 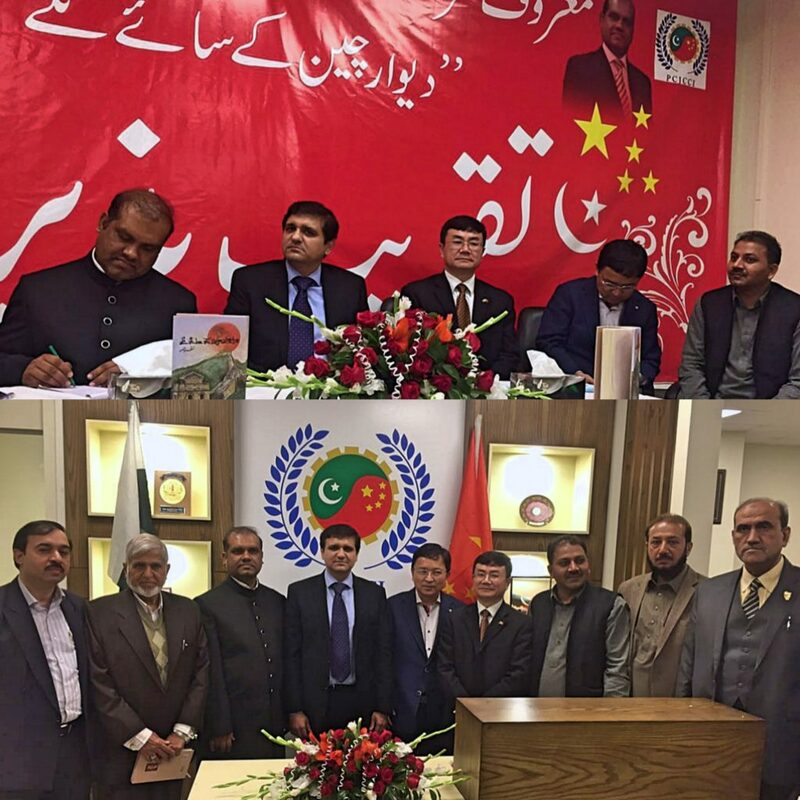 Naveed apprised that Pak- China Chamber provides one stop solution to Chinese delegates. The Ambassador also acknowledged the video conferencing service initiated by PCJCCI and contended that this will go a long way as it is time saving, cost effective and solution oriented program which can connect dozens of business people for prospective business matchmaking opportunities. The President PCJCCI apprised the Ambassador to open PCJCCI office at SUST border in order to facilitate land route cargo traffic through Khunjrab to China. Expressing gratitude to the Ambassador Yao Jing for the in-depth discussions, President S.M. Naveed expressed hope that this meeting will prove to be fruitful for the future prospects. "Agriculture is at pivotal moment and the digitization of agriculture will play an inexorable role for the industry moving forward” this was stated by President, Pakistan – China Joint Chamber of Commerce and Industry S.M. 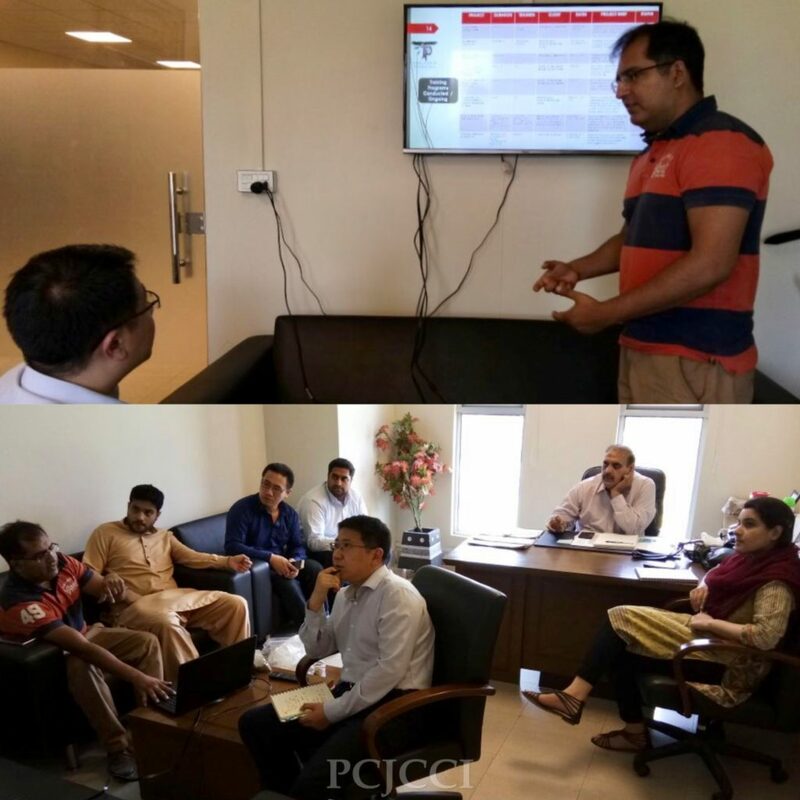 Naveed on May 23rd at PCJCCI office during a video conference held with the Chinese counterparts to mark out the striking prospects of agriculture sector in Pakistan. The conference was participated by President PCJCCI S.M. Naveed, Secretary General PCJCCI M. Salahuddin Hanif , Director Business Development Faraz Shafiq from Training Pakistan PVT Ltd, Director Guard Filter Shahrukh Malik, Mr. Frank Fa and Mr. Zhang Representatives of Chinse Business Community in Pakistan also attended the conference. MOU signed with Chinese Dream School for launching Conversational Chinese Language Program at Pakistan-China Joint Chamber of Commerce & Industry which will focus on faculty and student exchange programs to and from China. The program will also be introduced at renowned organizations like Punjab Skill Development Authority and Punjab Vocational Training Council (PVTC). Pakistan- China Joint Chamber of Commerce and Industry arranged a trade conference ceremony on Cargo Tricycles with the collaboration of Fujian Group of companies initiated by a Chinese company Fulin Tricycle Pakistan PVT Ltd whose operations are already running in China and the sole purpose behind this initiative was to expand their business monopoly in Pakistan. The members from Fulin Company introduced the product at the seminar held on May 16th, 2018 on PCJCCI premises. 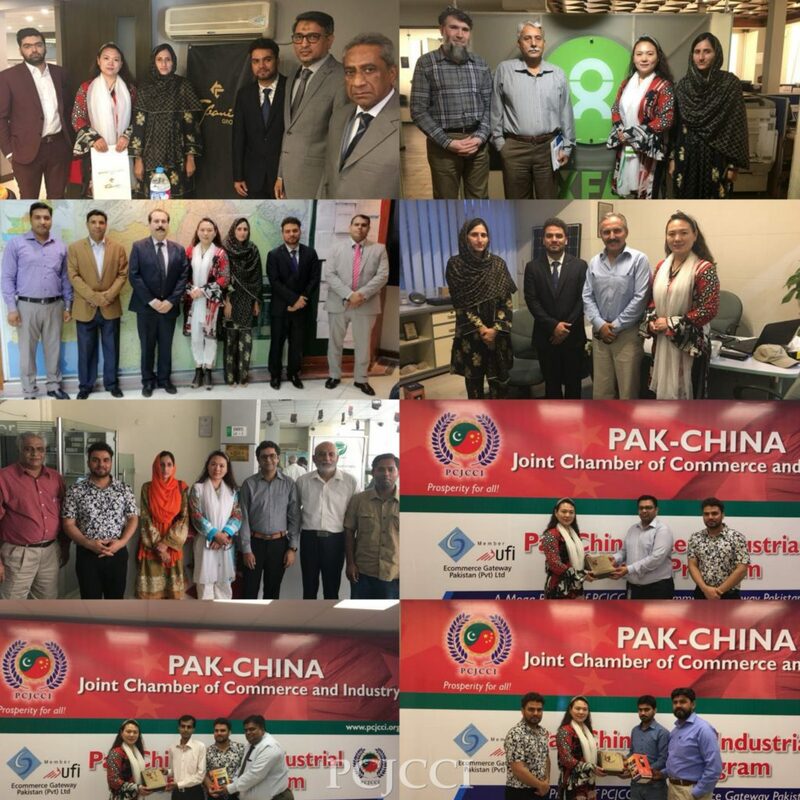 The seminar was participated by Salahuddin Hanif Secretary General PCJCCI, Dr. Iqbal Qureshi Senior Vice President PCJCCI, Mr. Daud Ahmed Executive Committee Member PCJCCI, Mr. Khalid CEO Fujian International, Mr. Zhang Yunde CEO Fulin, Mr. Sun Yong Xiang Marketing Manager Fulin Pakistan PVT Ltd, Ms. Fouzia Zahid Executive Director Fujian International and Zahid Ali Sakhi Director Fujian International group of companies along with other prestigious personalities. 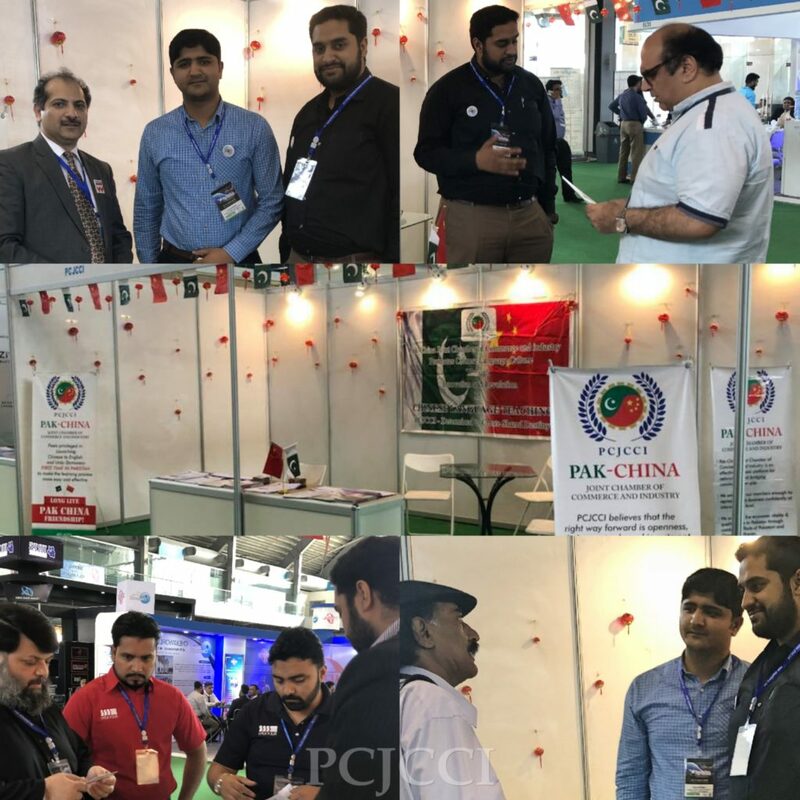 Team PCJCCI participated in Dream Expo 2018 which was held in Islamabad. This expo symbolized the spirit of Pakistanis who have a dream of building their homes and eventually the homeland. All individuals and institutional stakeholders got together in this expo to exhibit the solidarity to the cause of nation building through high ambitions and lofty dreams. 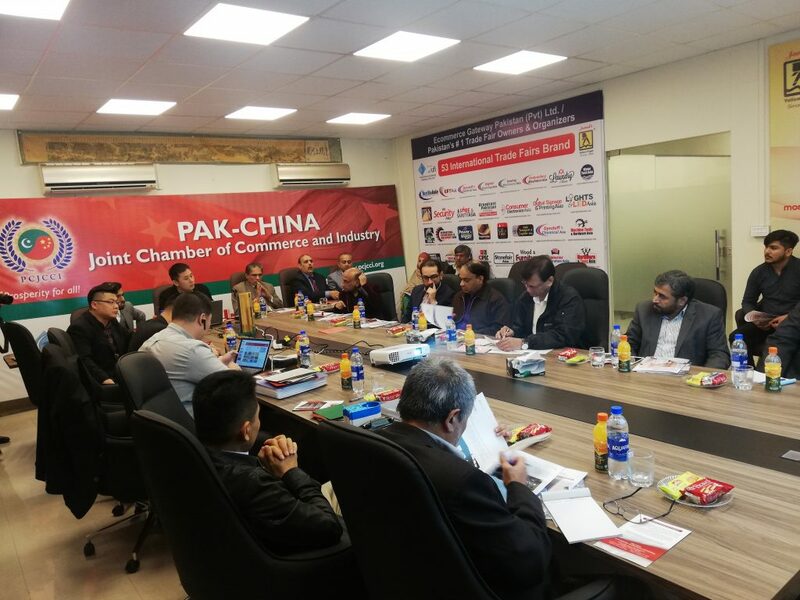 Our team met with possible prospects there, and explained to them the benefits of the membership of Pakistan - China Joint Chamber and how it can facilitate them in broadening their business. President PCJCCI Mr. S.M. 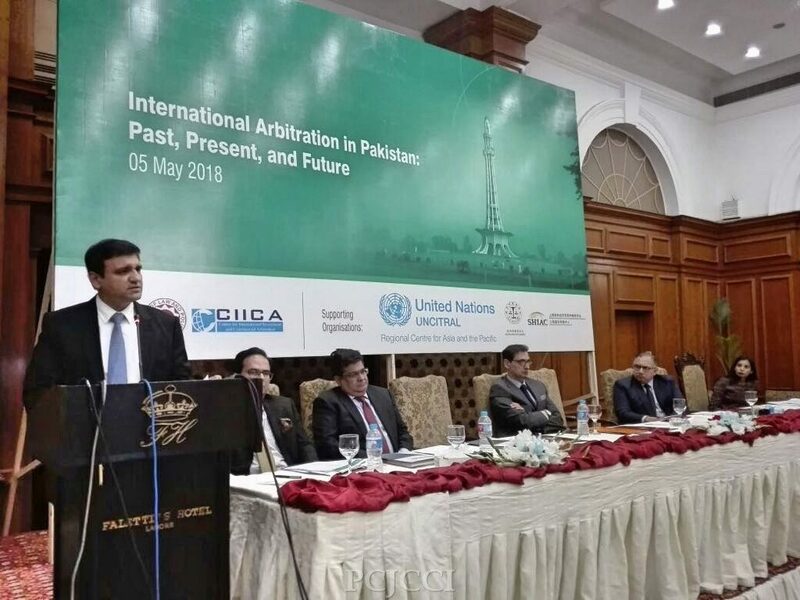 Naveed was invited tpo deliver a speech on CPEC at the International Arbitration Conference jointly organized by Center for International Investment and Commercial Arbitration (CIICA) and UMT School of Law and Policy (SLP). President PCJCCI while supporting the setting up of ADR centers apprised the participants that CPEC is a great opportunity to elevate employment in Pakistan. Presently not only 9000 Chinese but also 90,000 Pakistanis are working on CPEC projects. He added that the relocation of labor intensive industries to Pakistan will not only create room for employment here but will also bring latest technology, latest techniques and knowledge to bring revolution in the conventional norms of production and services. At the end, S.M. 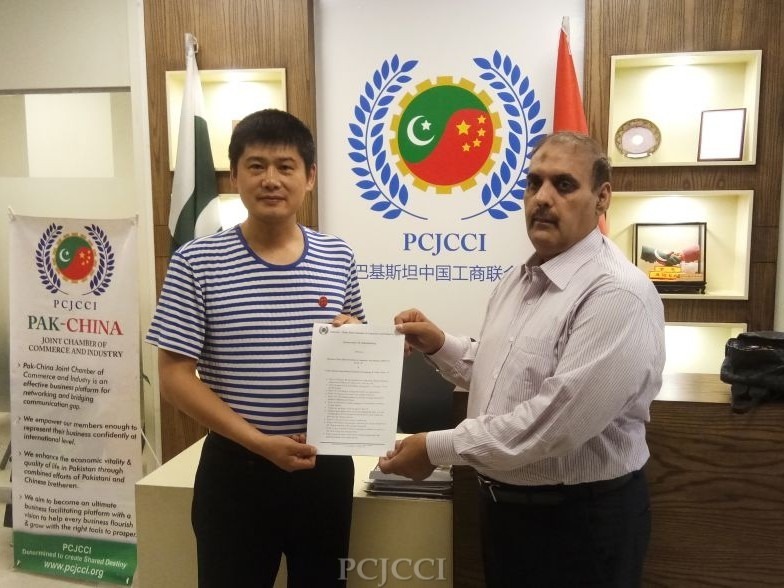 Naveed assured his fullest cooperation from the platform of PCJCCI and ensured his possible support in the upbringing of dispute resolution as a positive and meaningful initiative. A PCJCCI info-desk was setup at the 14th Health Asia International Exhibition & Conferences held at Expo on 10th-11th April. 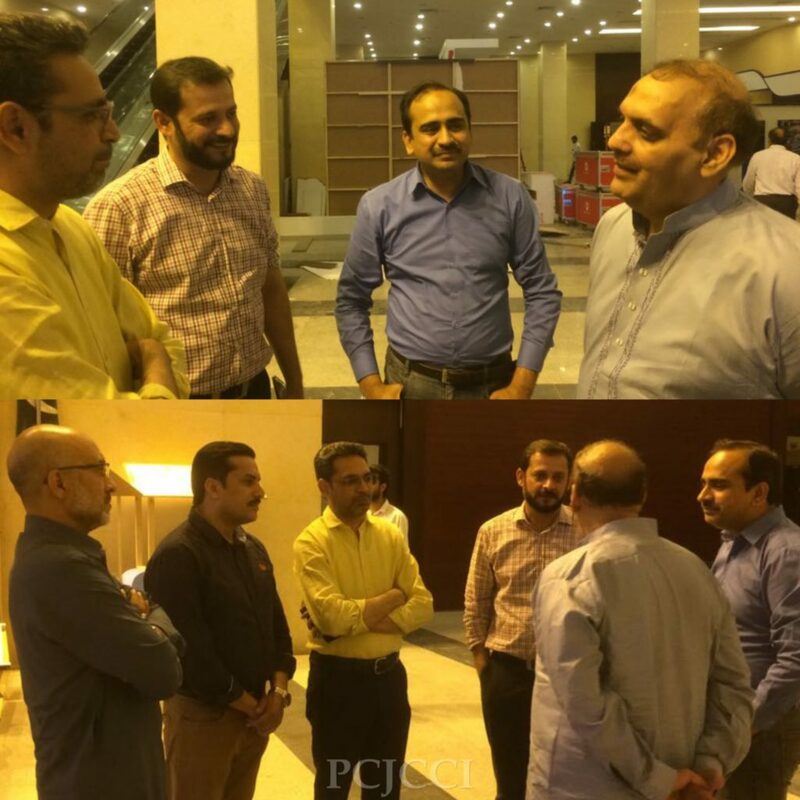 Team PCJCCI interacted with different organizations of the Pharmaceutical Industry of Pakistan. Corporate/Trade visitors and individuals working in the various fields of health sciences and medicine visited the desk and inquired about the possibilities offered by PCJCCI in these sectors. Chinese delegation arrived at Islamabad for the purpose of conducting various B2B meetings regarding disaster management and to build trade relations in this sector in Pakistan. With the help of PCJCCI, they successfully presented their products and pursued the opportunity of joint ventures with members of the chamber. The delegation visited various organizations in Pakistan. 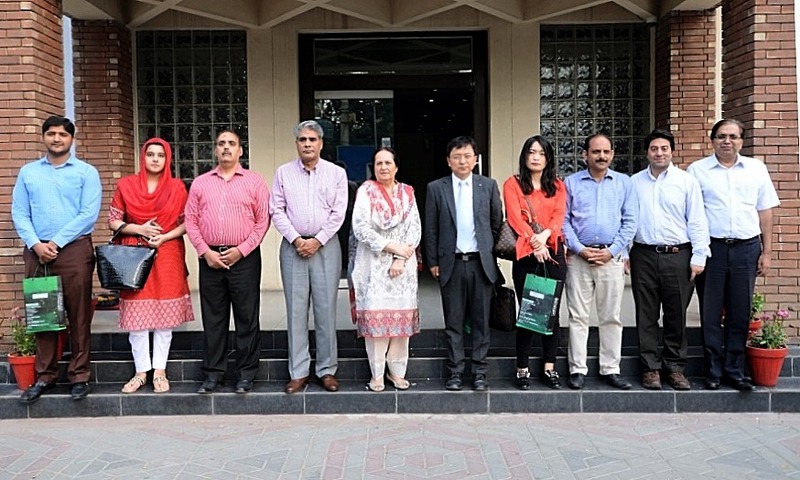 Their first visit was at National Disaster Management Authority where Dr. Khurram Shehzad briefed the delegates; leaded by Ms. Li Lefang CEO of Beian and her team about NDMA. Mr. Rafaqat from the team of delegates briefed about the products of Beian, and the meeting progressed with discussion of disaster management techniques, trainings and current initiatives. 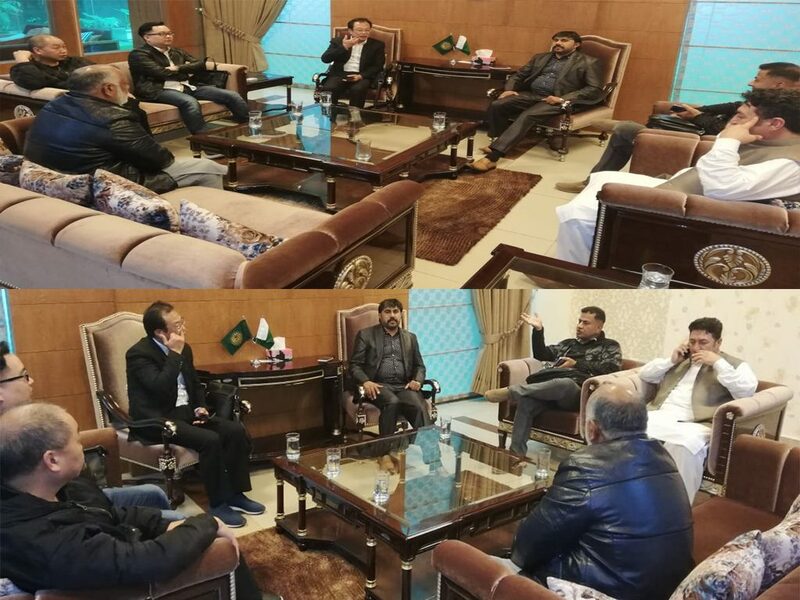 Further meetings were held at OXFAM, Tabani Group, Fujian, Pakistan Disaster Management Authority, Suzuki Motors, Pakistan Red Crescent Society (PRCS), Haseen Habib Trading Pvt Ltd, Toyota Walton, Hi-Tek Manufacturing (Pvt) Ltd. and NLC Foundland at Wagha Border. 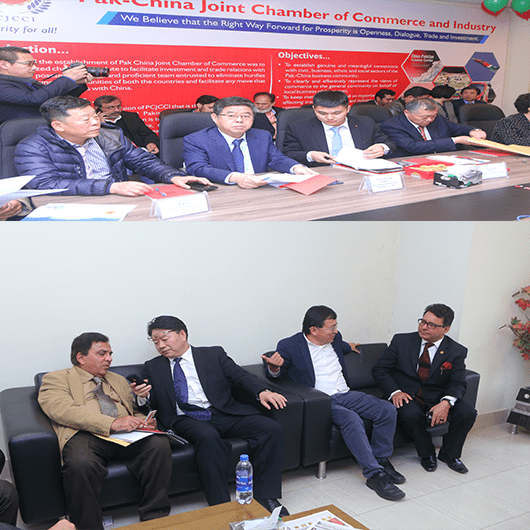 Pakistan China Joint Chamber of Commerce and Industry welcomed distinguished government officials from China Council of International Commerce, Jinan. The agenda of the visit was to discuss prospects of replacing inundated power technology with hot spring turbines. The delegation also put forth numerous propositions for the success of CPEC projects and to promote allied investment from Chinese private sectors with the cooperation of Pakistan China Joint Chamber of Commerce and Industry. 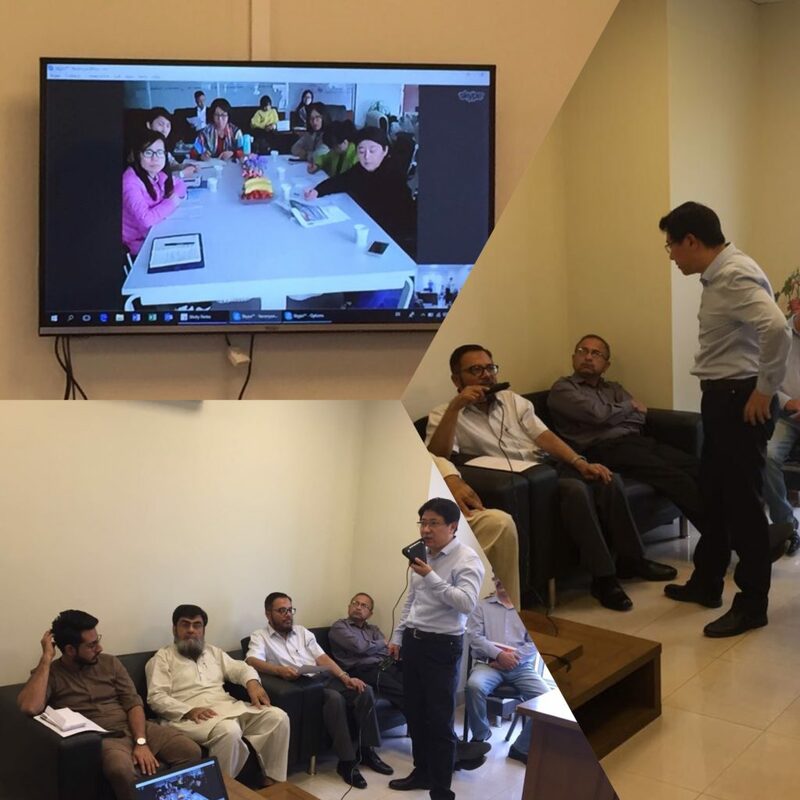 The video conferencing session was headed by Mr. Yusuf Fa – Chinese representative in Pakistan and Ms. Grace Meng from Jinan, China along with Mr. Roc Wang, Mr. Chris Zhu, Mr. Steve Zhu, Ms. Selina Wang, and Ms. Fiona Gao who also participated in the conference. The conference was attended by S.M. Naveed, President PCJCCI, M. Salahuddin Hanif, Secretary General PCJCCI and the top management of our member companies; Intersales Network (Pvt.) Ltd, Dawood Spinning Mills (Pvt) Ltd, NovaMed Pharmaceuticals (Pvt) Ltd., Sixon Pakistan Pvt. Ltd., Fasnna Group, Shermir Global Pvt. Ltd, Noble Origins Pvt. Ltd, Hi-Tek Manufacturing (Pvt) Ltd.
Mr. Wang Zihai, Former President PCJCCI delivered a presentation on CPEC at Nur International University. The students of the University were educated regarding the numerous advantages and benefits that have become available to the people of both Pakistan and China by building mutual relations through CPEC. Many Chinese companies will be coming to Pakistan for joint ventures and businesses. He encouraged the students to excel in their studies and gear themselves up to help their country make use of the upcoming opportunities. The launching ceremony of first employment exchange program was held on Thursday at PCJCCI Secretariat with the collaboration of Rozee.pk. Mr. Monis Rahman, CEO Rozee Pk appeared as Chief Guest whereas Mr. Wang Zihai, Dr. Iqbal Qureshi, Moazzam Ghurki, M. Salahuddin Hanif, Mr. Liu also participated in ceremony. Various dignitaries including CEO’s and renowned HR experts also participated in the ceremony to encourage the initiative taken by both PCJCCI and Rozee pk. PCJCCI arranged an exclusive appreciation ceremony for Mr. Husnanin Nazish for writing a very informative and interesting travelogue on his visit to China. The travelogue entitled as "Deewar-e-Cheen kay Saey Talay" is the great reflection of the writers’ experiences in the friendly Chinese community. 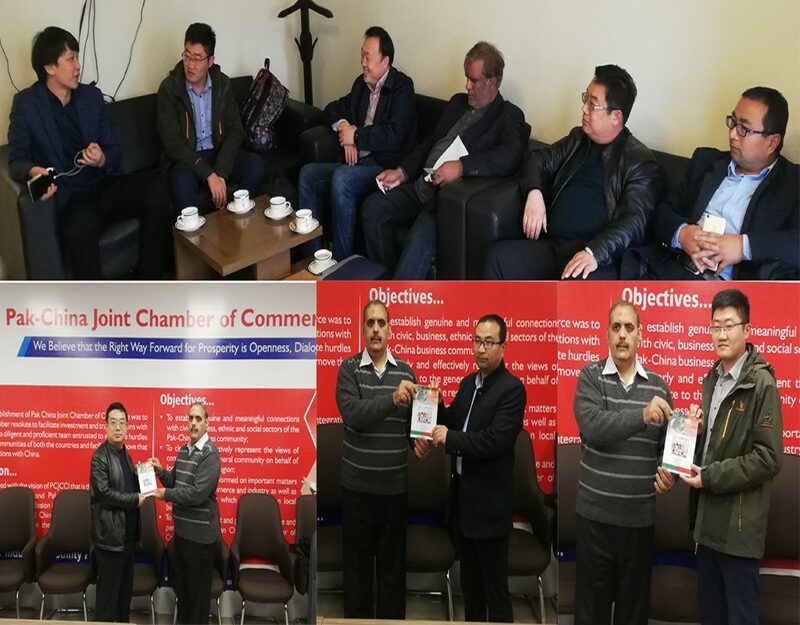 PCJCCI reviewed the travelogue and arranged anexclusive ceremony of Appreciation in which special remarks were expressed for Mr. Husnain Nazish by president PCJCCI, S.M. Naveed, Senior Vice president, Dr. Iqbal Qureshi and Vice President Rana Mehmood Iqbal. 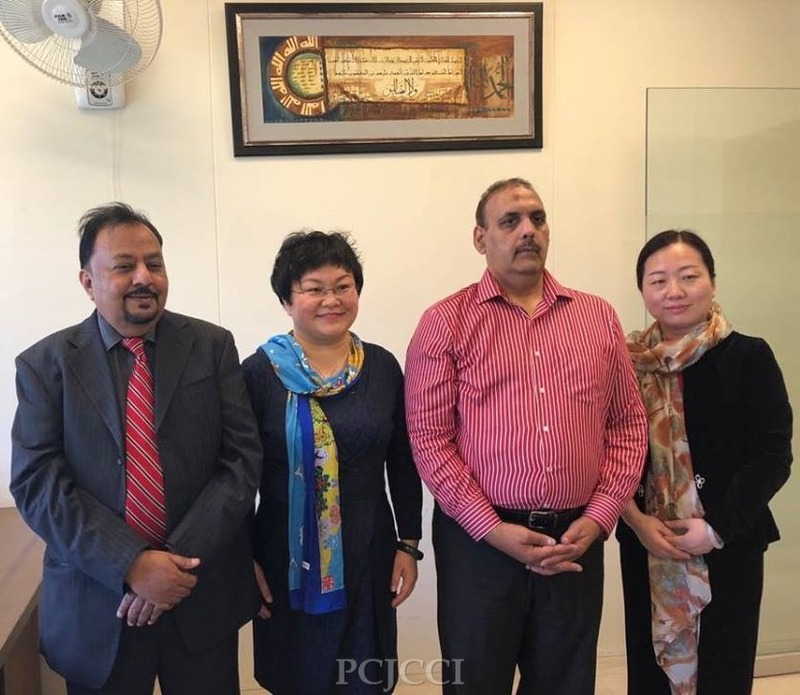 Other PCJCCI representatives and dignitaries including Mr. Wang Zihai, Moazzam Ghurki, M. Salahuddin Hanif, and various intellectuals and writers also participated in the ceremony. 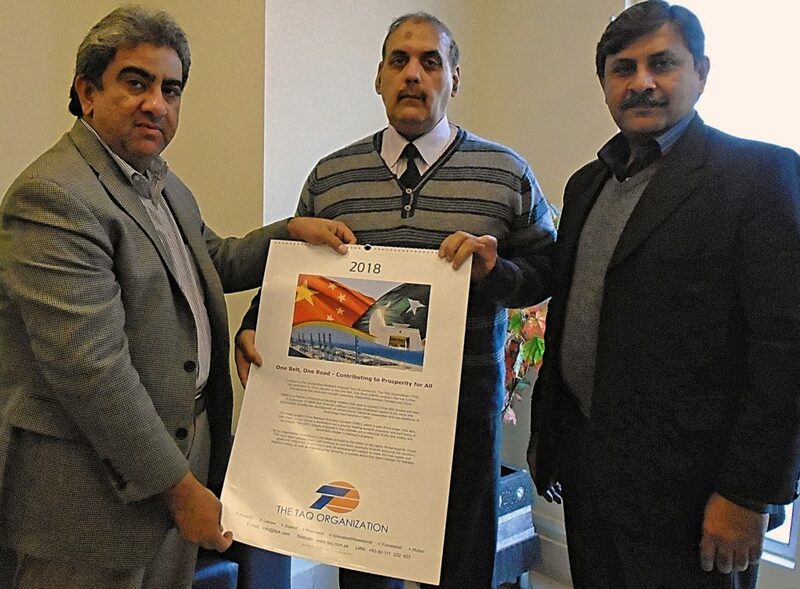 Mr. Amir Ismail, Senior Manager Commercial (Sales & Operations) from TAQ Enterprises Cargo Services (Pvt) Ltd. visited PCJCCI to apprise their services package and their probable role in CPEC & BRI. Mr. Amir Informed the senior committee of PCJCCI about their offices at all important border crossings and provisions of transportation throughout Pakistan along with handling the door delivery of shipments within most parts of Afghanistan and in the neighboring central Asia.